Adding vertical stripes to a loom knitting project adds pizzaz to the hat, shawl, or scarf you knit. The video uploaded by the yarn provider Lion Brand Yarn shows you how easy it is to add vertical stripes to your project. If interested you can find the Martha Stewart Crafts Knit & Weave Loom Kit By The Each (An Amazon affiliate link). used in the tutorial on Amazon.com. The video is short and is packed with good clear instructions on how to loom knit the vertical stripes. The instructor takes her time and makes slow and deliberate moves so that you can take in and understand what she is doing. The instructions are backed up by great video close-ups of the loom knitting being done. Besides the close-ups of the work being done the other thing included that I think is important for the viewer to see is a good example of what the loom knitted pattern or project will look like. Watch the video and get started adding stripes to your double knitted loom knitting projects. Thank you for writing. This loom knitting video is more about teaching loom knitters how to use multiple colors in any project. To find the videos about casting off try typing in cast off in the search box. If none of these are what you are looking for let us know and we will add another on how to cast off. Please excuse the delay in responding. 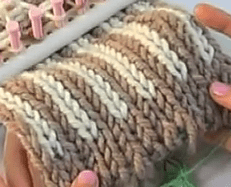 We looked for a quality video and will post one when we find a beginning to end video teaching loom knitters how to complete a knitting project using vertical stripes. I am still searching for a quality video demonstrating the cast off. I have been afraid to use my long loom, but I want to make a vertical striped project, and now I realize how easy the long loom is to use. have screechy voices, and I wish these talented ladies would use someone else to talk for them or learn to lower the tone a bit. I’m trying to to do this, but with only 1 stripe down the middle, but the video doesn’t say what the stitch prior to the adding of the new color is. Do you have any idea of what stick was used?? I was thing Figure 8, but I’m not sure. Thank you for visiting LoomKnittingVideos.com. he stitch being used is really a simple knit stitch. She is double knitting zig zagging the yarn then knitting the bottom loop over the top. I hope I understood what you are asking and was able to help. Again thanks for visiting. PS I am sorry about the delay in responding.